Kenyan female pugilist Conjestina Achieng has posted tremendous recovery steps after undergoing depression that saw her admitted at Mathari hospital for close check up and treatment. Conje was among the thousands of fans who turned up at the city stadium to watch Gor Mahia play Tusker in a Tusker premier league match on Sunday. She said she has been a diehard football fan ever since she was a child and her health issues have forced her out of the stadium for while. 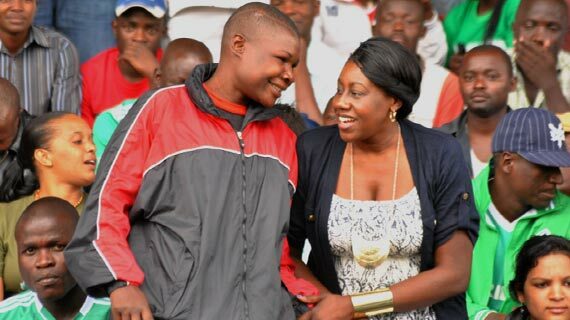 “I am happy to be back to watch soccer.” She said as her entry at the packed City stadium invited cheers from thousands of fans who expressed their excitement at seeing the former star back in good shape. "It feels good being in the stadium, the past few months haven’t been smooth for me. I love watching football and I am glad Gor won it because they played really well.” Added the boxer. Gor Mahia won the match 1-0 courtesy of a Dan Sserunkuma goal.